of a girl’s external genitalia for non-medical reasons. It is also known as female circumcision, cutting or sunna. 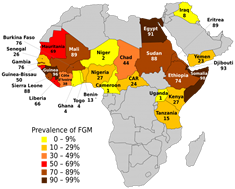 Religious, social or cultural reasons are sometimes given for FGM. However, FGM is child abuse. It is a dangerous and a criminal offence. It is illegal to carry out FGM in the UK or for a British citizen to be taken out of the UK for FGM to be performed. Through our Human Development and Relationships education, we teach our children about the natural human genitalia and use NSPCC resources to teach them that their “privates are private” – see resource below. At St Bernadette’s we will report any concerns we may have in order to protect girls from FGM. Since Oct 2015, we are required by law to report if we are informed by a girl that she has undergone an act of FGM, or if we observe physical signs that an act of FGM may have been carried out.